The only problem is that you have no idea how this is supposed to go. Sure, you’re picked up the latest edition of Magnificat, or maybe even have a book of Christian Prayer. However, you’re a music director, and you’ve never sung Vespers before. What do you do? Let’s take a walk through Evening Prayer in the Ordinary Form, and offer some good suggestions (that are by no means exhaustive) to use in St. Joe Schmoe’s Average Parish. Note: If you’ve been asked to prepare sung Morning Prayer, you’re in luck. It is identical to Evening Prayer in every way except for the Gospel Canticle, which is the Canticle of Zechariah in the morning where it is the Canticle of Mary in the evening. Also, Morning Prayer takes place in the morning instead of the evening, in case you need everything laid out for you. The first thing you might notice is that there is neither an entrance nor a concluding procession. 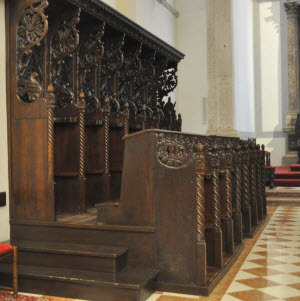 That is simply because, in the Liturgy of the Hours, there is not the same significance of a priest’s entrance as there is in the Holy Sacrifice of the Mass. A celebration of Evening Prayer does not require a priest or deacon at all. However, if a priest or deacon leads the prayer, there are slight differences in the liturgy, especially at the introduction and conclusion. The second thing I would call your attention to is the fact that nearly all, if not all, of this liturgy is sung. The Liturgy of the Hours is sung prayer, especially because they are primarily marked by the proclamation of the Psalms, which are the Church’s song. Keep this in mind as you prepare for this liturgy. Historically, Evening Prayer has been the focus of much effort on the part of composers, more so than any other Hour of the day. This is primarily because it took place at the end of the day, when workers could easily attend the rite, and is evidenced by the overwhelming number of choral Magnificats, which greatly outnumber their counterpart canticles in the other Hours. Next week, we will begin with suggestions on how to handle the first parts of Evening Prayer: the introduction, Hymn, and Psalms. This is where the real “meat” of Evening Prayer is, and there are lots of options for good celebration.